When your brand is down and people think your concepts are disconnected from rational people (and reality), what’s one to do? Copy others that are successful of course! The mental patients in town can be so predictable. I figured it was just a matter of time before some would hint that I was someone other than who I am, AGAIN. There’s probably other accusations I’ve forgotten by now, but they were FALSE, too. 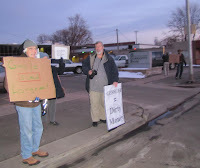 In the Sunday November 8, 2009 Longmont Ledger, sore loser candidate Kaye Fissinger went back to the usual ranting and raving Longmont is so accustomed to – and probably the reason they relegated her to the political basement when they decided who to vote for. Her latest screed is about the farthest you could possibly go in trying to make this connection and that connection, and the obvious paranoia probably warrants a new nickname: Backyard Chicken Little. In her tirade you’ll see lots of names and organizations you’ve never heard of, but she works real hard to try to define who the “bad guy” is. Essentially she’s saying the voters of Longmont are too stupid for their own good and have been fooled by these outside groups. All the web surfing and phone calls to like minded left wing loons must have been pretty time consuming – to basically end up with nothing of any great interest. Except sour grapes. That’s too bad. With that big money they rolled out the following programs and websites (one of which Ms. Fissinger uses as source material, surprise surprise) ProgressNow, Colorado Ethics Watch, Colorado Independent, ColoradoPols, SquareState, and Colorado Media Matters. But I’m sure they are all legitimate and full of sweetness and light and above all reproach. It’s only those nasty right wing sites and organizations that should be questioned. 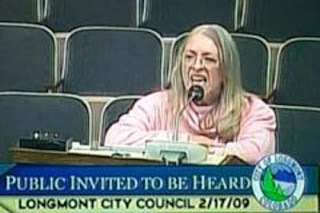 Then Ms. Fissinger (now being called “The Finger” after saying she’d like to “flip off” eventual Mayoral race victor Bryan Baum at a forum in front of high schoolers) brings up the money Montana-based Western Tradition Partnership (WTP) and Longmont Leadership Committee spent on the election. She says WTP, an evil 501(c)4, contributed $10,000. Yet she fails to mention another 501(c)4, Virginia-based Defenders of Wildlife Action Fund, who contributed $1.6 million to defeat former congresswoman Marilyn Musgrave. Last I checked Virginia is a lot farther from Colorado than Montana, and WTP has a Denver office as well. The hypocrisy and double standards of the Left wing Lunatic Fringe doesn’t even cause them to bat an eye as they just keep spinning one story after another. Ms. Fissinger is in denial and counterattack mode now that the voters of Longmont, in big numbers, completely rejected her platform and those of Karen Benker, and Bill Van Dusen. What’s even sadder for Ms. Fissinger is that almost 600 voters who voted for Van Dusen, couldn’t bring themselves to vote for her, instead throwing votes to Ed Dloughy, Gabe Santos, or Alex Sammoury. Ironic that Gabe Santos of all people should take some of her votes after her endless, and continued bringing up of Tom DeLay. HINT: It doesn’t seem to be working “Finger”, but most of your ideas and propaganda don’t resonate with normal people anyway. Isn’t it about time you went after a church and attacked its members? The people have spoken (at least that’s what we hear when their side wins), and they apparently know a loser (or pack of them) when they see one. Some big outside money opposition didn’t unseat Karen Benker or block Kaye Fissinger and Bill Van Dusen from getting onto City Council. They can whine and complain about why they were pummeled by the voters, but to keep it simple remember this quote from pro-football head coach Bill Parcels, “You are what your record says you are.” ‘Nuf said. As Ms. Fissinger spins her tale of how she was targeted unfairly, and mentions me by name, she forgets to mention something else she did during the campaign: In tandem with now former Longmont City Councilmember Karen Benker, Ms. Fissinger did a little snooping of private residences and political opponent’s workplaces. Namely, me. I work at a high security Federal facility, and she named it in her email exchanges with Ms. Benker. This is how they operate: if you can’t win fairly, win dirty. Of course, neither of them won anything in the election.